Version 1.002. Last Updated: 02/04/2019. In this project, you will design agents for the classic version of Pacman, including ghosts. Along the way, you will implement both minimax and expectimax search and try your hand at evaluation function design. The code base has not changed much from the previous project, but please start with a fresh installation, rather than intermingling files from project 1. Note: If your python refers to Python 2.7, you may need to invoke python3 autograder.py (and similarly for all subsequent Python invocations) or create a conda environment as described in Project 0. By default, the autograder displays graphics with the -t option, but doesn't with the -q option. You can force graphics by using the --graphics flag, or force no graphics by using the --no-graphics flag. The code for this project contains the following files, available as a zip archive. multiAgents.py Where all of your multi-agent search agents will reside. pacman.py The main file that runs Pacman games. This file also describes a Pacman GameState type, which you will use extensively in this project. util.py Useful data structures for implementing search algorithms. You don't need to use these for this project, but may find other functions defined here to be useful. Files to Edit and Submit: You will fill in portions of multiAgents.py during the assignment. Once you have completed the assignment, you will submit a token generated by submission_autograder.py. Please do not change the other files in this distribution or submit any of our original files other than this file. Inspect its code (in multiAgents.py) and make sure you understand what it's doing. How does your agent fare? It will likely often die with 2 ghosts on the default board, unless your evaluation function is quite good. Note: As features, try the reciprocal of important values (such as distance to food) rather than just the values themselves. Note: The evaluation function you're writing is evaluating state-action pairs; in later parts of the project, you'll be evaluating states. Note: You may find it useful to view the internal contents of various objects for debugging. You can do this by printing the objects' string representations. For example, you can print newGhostStates with print(newGhostStates). Options: Default ghosts are random; you can also play for fun with slightly smarter directional ghosts using -g DirectionalGhost. If the randomness is preventing you from telling whether your agent is improving, you can use -f to run with a fixed random seed (same random choices every game). You can also play multiple games in a row with -n. Turn off graphics with -q to run lots of games quickly. Don't spend too much time on this question, though, as the meat of the project lies ahead. Now you will write an adversarial search agent in the provided MinimaxAgent class stub in multiAgents.py. Your minimax agent should work with any number of ghosts, so you'll have to write an algorithm that is slightly more general than what you've previously seen in lecture. In particular, your minimax tree will have multiple min layers (one for each ghost) for every max layer. Your code should also expand the game tree to an arbitrary depth. Score the leaves of your minimax tree with the supplied self.evaluationFunction, which defaults to scoreEvaluationFunction. MinimaxAgent extends MultiAgentSearchAgent, which gives access to self.depth and self.evaluationFunction. Make sure your minimax code makes reference to these two variables where appropriate as these variables are populated in response to command line options. 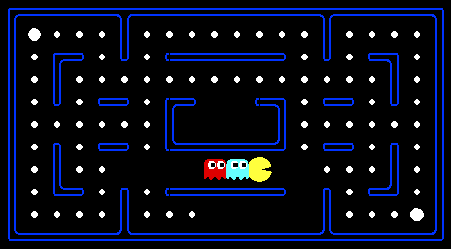 Important: A single search ply is considered to be one Pacman move and all the ghosts' responses, so depth 2 search will involve Pacman and each ghost moving two times. Hint: Implement the algorithm recursively using helper function(s). The correct implementation of minimax will lead to Pacman losing the game in some tests. This is not a problem: as it is correct behaviour, it will pass the tests. The evaluation function for the Pacman test in this part is already written (self.evaluationFunction). You shouldn't change this function, but recognize that now we're evaluating states rather than actions, as we were for the reflex agent. Look-ahead agents evaluate future states whereas reflex agents evaluate actions from the current state. The minimax values of the initial state in the minimaxClassic layout are 9, 8, 7, -492 for depths 1, 2, 3 and 4 respectively. Note that your minimax agent will often win (665/1000 games for us) despite the dire prediction of depth 4 minimax. Pacman is always agent 0, and the agents move in order of increasing agent index. All states in minimax should be GameStates, either passed in to getAction or generated via GameState.generateSuccessor. In this project, you will not be abstracting to simplified states. On larger boards such as openClassic and mediumClassic (the default), you'll find Pacman to be good at not dying, but quite bad at winning. He'll often thrash around without making progress. He might even thrash around right next to a dot without eating it because he doesn't know where he'd go after eating that dot. Don't worry if you see this behavior, question 5 will clean up all of these issues. Make sure you understand why Pacman rushes the closest ghost in this case. Make a new agent that uses alpha-beta pruning to more efficiently explore the minimax tree, in AlphaBetaAgent. 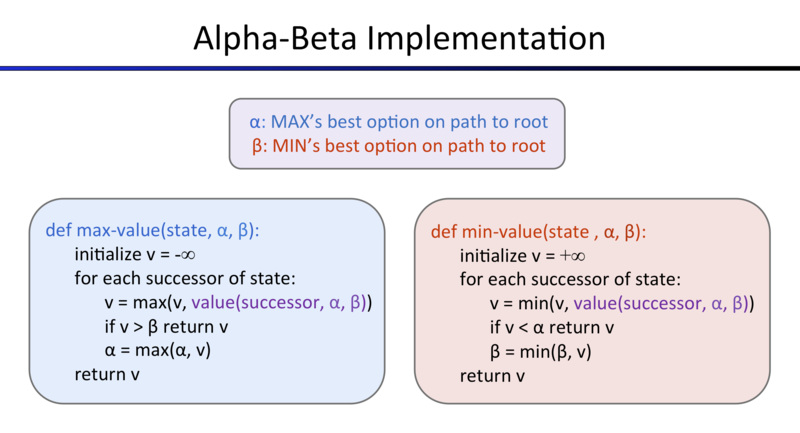 Again, your algorithm will be slightly more general than the pseudocode from lecture, so part of the challenge is to extend the alpha-beta pruning logic appropriately to multiple minimizer agents. You should see a speed-up (perhaps depth 3 alpha-beta will run as fast as depth 2 minimax). Ideally, depth 3 on smallClassic should run in just a few seconds per move or faster. The AlphaBetaAgent minimax values should be identical to the MinimaxAgent minimax values, although the actions it selects can vary because of different tie-breaking behavior. Again, the minimax values of the initial state in the minimaxClassic layout are 9, 8, 7 and -492 for depths 1, 2, 3 and 4 respectively. Grading: Because we check your code to determine whether it explores the correct number of states, it is important that you perform alpha-beta pruning without reordering children. In other words, successor states should always be processed in the order returned by GameState.getLegalActions. Again, do not call GameState.generateSuccessor more than necessary. The pseudo-code below represents the algorithm you should implement for this question. The correct implementation of alpha-beta pruning will lead to Pacman losing some of the tests. This is not a problem: as it is correct behaviour, it will pass the tests. Minimax and alpha-beta are great, but they both assume that you are playing against an adversary who makes optimal decisions. As anyone who has ever won tic-tac-toe can tell you, this is not always the case. In this question you will implement the ExpectimaxAgent, which is useful for modeling probabilistic behavior of agents who may make suboptimal choices. Debugging on these small and manageable test cases is recommended and will help you to find bugs quickly. Once your algorithm is working on small trees, you can observe its success in Pacman. Random ghosts are of course not optimal minimax agents, and so modeling them with minimax search may not be appropriate. ExpectimaxAgent, will no longer take the min over all ghost actions, but the expectation according to your agent's model of how the ghosts act. To simplify your code, assume you will only be running against an adversary which chooses amongst their getLegalActions uniformly at random. You should find that your ExpectimaxAgent wins about half the time, while your AlphaBetaAgent always loses. Make sure you understand why the behavior here differs from the minimax case. The correct implementation of expectimax will lead to Pacman losing some of the tests. This is not a problem: as it is correct behaviour, it will pass the tests. Write a better evaluation function for pacman in the provided function betterEvaluationFunction. The evaluation function should evaluate states, rather than actions like your reflex agent evaluation function did. You may use any tools at your disposal for evaluation, including your search code from the last project. With depth 2 search, your evaluation function should clear the smallClassic layout with one random ghost more than half the time and still run at a reasonable rate (to get full credit, Pacman should be averaging around 1000 points when he's winning). If you win at least once without timing out the autograder, you receive 1 points. Any agent not satisfying these criteria will receive 0 points. +1 if your games take on average less than 30 seconds on the autograder machine, when run with --no-graphics. The autograder is run on EC2, so this machine will have a fair amount of resources, but your personal computer could be far less performant (netbooks) or far more performant (gaming rigs). The additional points for average score and computation time will only be awarded if you win at least 5 times. In order to submit your project, run python submission_autograder.py and submit the generated token file multiagent.token to the Project 2 assignment on Gradescope.